3uTools is a practical piece of software that makes it easy to jailbreak your iOS device or flash other firmware versions to receive additional functionality or unlock certain restrictions. The program offers several features for flashing firmware to your iOS device. Using the basic flashing tool you just need to select the firmware you want to flash, enable or disable user data deletion and press the Flash button. However, there’s also an advanced tool that lets you customize additional parameters like baseband upgrade skip, SHSH query, system partition size and activation. 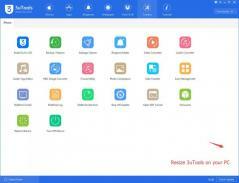 You can also rely on 3uTools to jailbreak your iOS device using the dedicated function. You just need to select a supported firmware and follow the provided instructions.